The Jamie Lynn Phoenix C2 Power BTX, 2012 C2 Power BTX, 2011 C2 BTX 2010 Lib Tech Jamie Lynn Phoenix BTX. 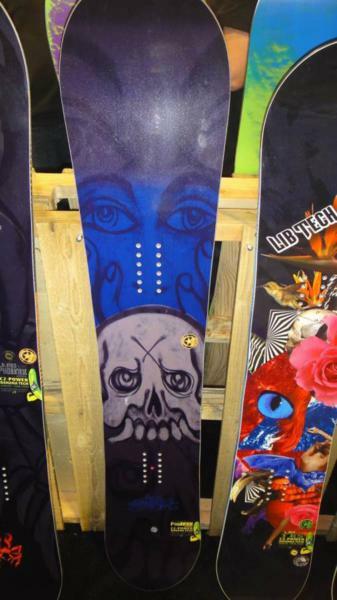 Of the Three Phoenix boards, it has the least aggressive (still pretty aggressive though) all mountain ride but will probably fit the widest scope of riders. We felt the Jamie Lynn Classic C3 and Lando Phoenix are an extension of this Good Ride favorite and might fit your aggressive all mountain needs just as much as the Jamie Lynn. Conditions: Everything from 3 feet plus powder to hard icy conditions. Set Up– Set back and Centered. 18 front -9 back, 15 front -15 back, 15 front -3 back and probably a few others. 22.5-23.5 Inches wide. Basically, we have set this up a lot of different ways. The Jamie Lynn Phoenix and the Phoenix line is pretty specific to the traditional aggressive all mountain rider. The Jamie Lynn at least comes in an almost full range of sizes where the others don’t so it fit’s the most riders. If you like stability at speed but still wants a hybrid rocker this could be the right choice. We felt this was one of our favorite aggressive all mountain boards out there and it’s Peters’ All mountain board. Many people come to us saying that they think the T.Rice is their board but after learning about their riding style, shoe size n such we end up pointing them in this direction. On Snow Feel: The Jamie Lynn Phoenix has a very aggressive but still catch-free feel which is pretty hard to do. It’s about as stable as a hybrid rocker board can get. It only feels a little bit loose in harder conditions but nothing like most C2 BTX boards we tried. One footing and flat basing is pretty stable and easy. The Lynn Phoenix has a very different personality compared to many other Mervin boards. It’s not a very quick edge to edge kind of board and has a personality that invites straight lining, carving and directional powder riding. Powder: The directional twin shape, the set back stance, and the hybrid rocker design make for a borderline excellent performance in powder. Most people aren’t pro’s and it’s much more fun for the average riders like us to hit powder set back with a little more float in the nose. The Jamie Lynn is not a slash between tight trees board like the Billy Goat but it does ok there. It takes some work from edge to edge and is more for that open face straight line. 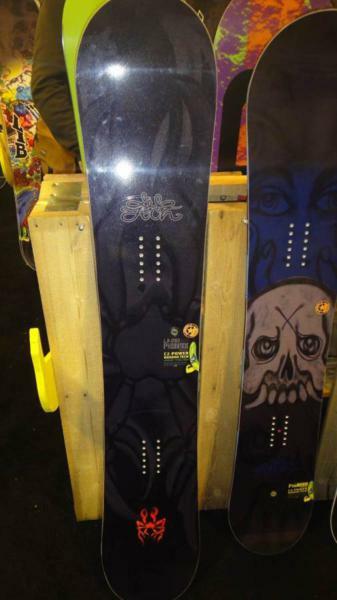 If you want a quicker more slashy board in powder, take a look at the Gnu Billy Goat. The C2 Power BTX hybrid rocker profile makes for an easy float and this board planes well in deep thick powder. The Lando has twice the set back as the Lynn so it’s got a more directional float. Turn Initiation and Carving– The Phoenix has a shallow sidecut depth that makes the board want to go straight more than it wants to turn. Some will like the easier turn initiation that other C2 boards but others will prefer the extra work it takes when it comes to short radius/quick turns. Medium to wider radius turns feel really good and are where this board shines. When it comes to carving you aren’t going to get that fun work for it feeling like you would on the Lynn Classic but it’s really good for a hybrid rocker board and it’s washy at all. It’s probably one of our favorite hybrid rocker boards to lay out a carve on. Speed: The stiff flex, fast base and stable ride for a hybrid rocker board make the Phoenix a lot of fun for straight lines. It was right there with the C2 Horsepower Travis Rice in terms of stability at speed and we really liked it. It’s never totally safe to bomb on hardpack but we found this board to help us forget about the snowment below us as we picked up speed on some of the steeper parts of the mountains we rode on this. It doesn’t have that loose feeling between the feet, like a skateboard with loose trucks, that most hybrid rocker boards give you when flat basing at high speeds. You sacrifice a little pop for this but in our opinion, it’s totally worth it. Uneven Terrain: For a board of this flex you would think that it would perform worse here but with a pair of good shock absorbent bindings it can handle uneven/bumpy end of the day resort snow rather well. Approximate Weight– No record breaker here but it wasn’t heavy. It was a little bit on the heavy side of medium when it came to weight. It is well built so again it’s worth a little weight to have it around longer than the average board. Edge Hold: The way these boards both held an edge was exceptional. We liked the mellow MTX side cut as well. It didn’t have that ultra grippy feel that the Lib Tech TRS or the R.Rice does but it holds in most conditions you want to ride. It’s not an ice specialist like the T. Rice and TRS but it’s still got some good grip. What is cool is the ability to ride in softer and thicker snow because it doesn’t grab like the more pronounced MTX side cuts do This can usually be a big problem for some when it comes to riding in soft conditions. Flex: This is a medium to stiff flex so at least when it is new you aren’t going to get much butter ability out of it. We found the Phoenix would not let you flex much past the rocker between the feet without a lot of effort which is similar to the T.Rice. It was like a narrow Travis Rice board when it came to flex. Switch: When you center the stance it’s almost excellent riding switch or regular but we could feel a difference. Still, it is a great board to center up the stance on groomer days to ride switch and then set back on pow days for better float. Jibbing– Nothing special here. The flex is a bit too stiff for our taste when it comes to riding around through the jib park or tackling very large technical kinked rails. It’s still ok for wider boxes and bonks if you see one on your way to the pipe or roller coaster park. As the board softens up it isn’t terrible and Peter will occasionally take this through the jib park without too much issue but he’d much rather be on the box scratcher. Pipe: Really fun in the pipe. It holds an edge very well and could almost be a dedicated pipe board. However, in our opinion, it is missing something that the TRS or Hot Knife have here. It just feels a little sluggish when throwing it around. Jumps: Like the pipe, this is a really fun jump board but it’s just missing that easy feeling that happens with many slightly softer true twins that are made for lapping the roller coaster park. When it came to generating your own air it was pretty springy but wasn’t super springy. We think they traded stability between the feet over spring for ollies and we are more than ok with that. This will be excellent for hitting natural terrain on a powder day and not bad in the park. All in all, we were very impressed with the all-around mostly mountain performance that the Jamie Lynn gave us. If you are looking for a directional twin with a set back stance that can bomb, ride very well in powder and accommodate you when you have freestyle moods then either Phoenix will be one of the better choices you can make out there. We try to get as many images of the Lib Tech Jamie Lynn Phoenix C2 BTX, but forgive us if they're not all there. This board is not made for beginners, that's for sure! It really handles powder with ease, makes it what powder must be for snowboarding, a pleasure! It's super fast and it's not just the base, I am talking about the confidence it gives you to ride it fast and hard. Actually it feels like it is ment to be ridden that way. Jumping is also easy with this board on, basically I found the torsional flex to help taking off correctly. Really good pop, and generally it's nice jibbing around with this board as long as you don't start spinning at every jump. I found this as not a strong point. I agree with some other reviews about this board, it is a bit heavy compared with other boards (my Nitro Team is way lighter!) but to be honest the board is not made for the park.. The only thing I can comment negatively about this board is that is not as easy to turn on low speed and requires more work, but hey, it is not made for low speeds. Actually filling the contact points a little bit does help. Hi JJ here, I'm doing a review of the LibTech Jamie Lynn Phoenix 157 C2BTX 2012/2013. I'm 33yo, 5"8 and 165lbs, athletic, and I've been riding an average of 40days per year since 1997. I've owned about 20 boards since I started, mostly AllMountain and FS! I've ridden this board in August 2012 in NZ for a month, and I'm currently riding it in Niseko Japan, in epic powder conditions. Groomers: a fast and very stable board. Edge hold and grip are excellent. The torsional flex of the board is quite easy to work. Forgiving but not as aggressive as I'd like edge to edge.The sidecut is great for medium to large carved turns, but jumping edge to edge from one small turn into another is not its forte. The board is comfortable and absorbs crappy terrain/snow well, with the bonus of poppy tips to bounce around any obstacle on the way, though its weight limits it agility at low speeds. Powder: it really shines there! It handles deep pow very well. Took it heliskiing in Wanaka, NZ, on big open faces and had an absolute blast.it pops great off powder, very fun to butter around in the deep pow and throw tricks off natural features. It's very forgiving, as well as stable which helps sketchy switch landings in pow. Between tight threes in powder it requires more work, but still floats and carries its speed very well. I prefer my Yes TDF there. Basically wether you charge or cruise it will do great in powder. Park: The flex is easy to load and releases a good pop. Ollies are easy off any features, but the weight can be felt when buttering or when doing tricks at lower speeds. The landings are stable and forgiving. If you land nose or tail heavy the flex helps you make it, and the edge grip can be controlled very easily to finish a spin sliding. It would probably be better one size down for me in the park, but I bought it as the backcountry FS board of my quiver. All in all a great allrounder, and the bonus of classic Jamie Lynn art!